Clair has multiple CD's, mostly yoga/meditation music, and one yogic breathing CD for use by students to assist in their home practice of yoga/meditation/kirtan/chanting. Clair's music is used in yoga classes and bodywork sessions around the globe. Visit www.clairoaks.com to hear/purchase her music. Listen to Clair's music. Clair believes all beings can learn to experience their true nature, beyond the labels and roles that our culture may assign us. She often refers to this true nature as Love, or Consciousness or the Self with a capital "S", and maintains that the more we are able to experience ourselves as our True Selves, the more we are equiped to serve the greater good of all beings no matter what we do. Clair's passion for living, learning and sharing, continue to fuel her study and inform her work, whatever form it may take. Kirtan is the call and response, yogic practice of musical meditation. Join us to experience how the band, (Clair Oaks, Susan Graves, Bob Cozzolino, EJ Simpson, Jay Popky, and Michelle and Angela Armour) through music and chanting, can help lift your spirit and open your heart. You'll leave refreshed and settled in your most authentic self. No singing or kirtan experience necessary. Families with children welcome! 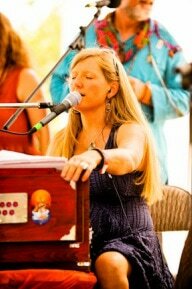 Click here for dates for upcoming kirtan events.